Bruce Anstey, riding the the two stroke Valvolene by Padgetts Racing YZR Yamaha, powered to a stunning victory in today’s Motorsport Merchandise Formula 1 Classic TT Race on the Isle of Man, making history on the way. 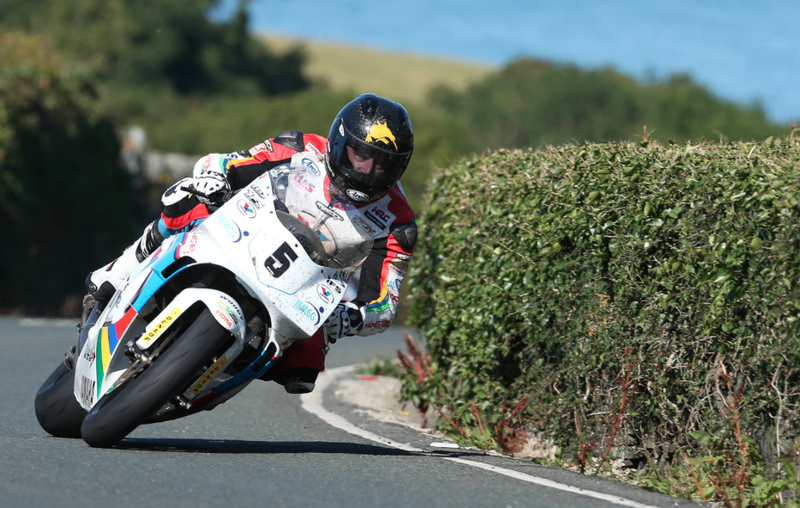 As well as establishing a lap record of 123.894mph (18:16.324) for the F1 class, Anstey’s time was also the fastest ever two stroke lap of the TT Mountain Course, breaking Ian Lougher’s record set on a 500 V-twin Honda in the 1999 Senior TT. Anstey dominated the race from the start and eventually won by over a minute from James Hillier with Russ Mountford securing the final podium place. Clerk of the Course Phil Taubman described conditions as perfect around the Mountain Course ahead of the Race, part of the Isle of Man Classic TT Races presented by Bennetts, which got away at 14.45. Michael Dunlop, the 2013 race winner and lap record holder, was first away from the start line on the Team Classic Suzuki XR69 but Anstey had established a three second lead over Jackson Racing’s James Hillier, on the ZXR 750 Kawasaki by the first timing point at Glen Helen with Dunlop completing the top three less than half a second behind Mountford. Team York Suzuki Racing’s Russ Mountford, on another XR69, was less than a second behind Dunlop in fourth with Gary Johnson on the ’85 Harris completing the top five. Anstey’s record breaking opening lap of 123.894 gave him a lead of 15 seconds over Dunlop who opened with 122.152 but it was all change at the end of the first lap with both Anstey and Dunlop opting to refuel. Hillier and Steve Mercer on the Mistral Racing Kawasaki chose to go straight through, with Hillier leading Mercer by 17 seconds at Glen Helen on the second lap with Anstey almost six seconds behind Mercer in third following his pit stop. It was clear that Michael Dunlop was losing time on the second lap and by Ramsey Anstey had passed the Irishman on the road. Hillier remained in the lead at the end of the second lap but with the Mistral Racing Man pitting at the end of the lap, Anstey moved back into the lead and with Michael Dunlop retiring in the pits at the end of his second lap, Anstey was firmly in control of the race. The Kiwi established a 53 second lead from Hillier at Glen Helen on the final lap and brought the YZR Yamaha home to win by over a minute from Hillier with Mountford a further nine seconds back in third. Hillier had the consolation of winning the inaugural Joey Dunlop trophy as the first 750 machine with Russ Mountford confirmed in the final podium place. Anstey appropriately received his trophy from fellow Kiwi Graeme Crosby, the 1981 F1 TT Race winner. Kiaran Hankin, riding the KHHire RC30, was the first privateer to finish, coming home in seventh. Yamaha’s dominated the F2 Race that ran concurrently with Ian Lougher’s opening lap of 107.999 giving the Welshman, who won Saturday’s Bennetts 500cc Race, a seven second lead over Chris Moore with Stuart Garton a further 3.5 seconds back in third. Yamahas occupied nine of the top ten places on the opening lap with only Derek Glass on a Kawasaki in eighth breaking the monopoly. With Lougher pitting at the end of the first lap Moore moved to the front but with Moore then refuelling on the second lap, Lougher moved back into the lead. That remained the top three with Lougher winning with a final lap of 111.064, the fastest lap of the race, for an overall time of 107.933 (1:02.55.328), 54 seconds ahead of Moore (106.420/1:03.49.017) with Garton, the first privateer in the F2 Class, third with 106.145/ 1:03.58.925.